Enriched with stevia for taste, this bulk-forming laxative is high in both fibre and mucilage. Hydrated husks swell, forming a gelatinous mass that keeps feces hydrated and soft. The resulting bulk stimulates a reflex contraction of the walls of the bowel for a laxative effect. 100% psyllium husk, partially ground, and enriched with prebiotics eliminates toxins and waste from the gastrointestinal system slowly as it supplies healthy fibres. Inulin feeds the probiotic bacteria population in the colon, which in turn contributes to human health in many ways. Inulin is good for proliferation of bifidobacteria and reduction of detrimental bacteria, reduction of toxic metabolites and detrimental enzymes, prevention of pathogenic and autogenous diarrhea, prevention of constipation, protection of liver function, reduction of blood pressure, and production of nutrients. 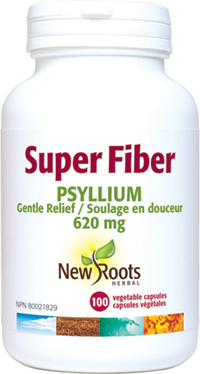 Psyllium husk is excellent for softening the stool, preventing constipation as well as hemorroids and colitis. Adults: Take 3 capsules twice daily (morning and evening) with 8 oz. of water or juice, before or after meals. Follow with a second glass of liquid. Effects observed 12–24 hours after first dose, and may take 2–3 days. If you are taking other medications, take this product 2 hours before or after them. Other ingredients: Inulin in a non‑GMO vegetable capsule composed of vegetable carbohydrate gum and purified water.